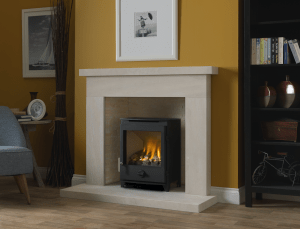 Paragon branded efficient, realistic high quality gas flame technology is now available in a freestanding stove design both for conventional and balanced flue systems. The new Paragon gas stove models are manufactured with heavy-duty, seam-welded steel bodies and doors in keeping with high quality solid fuel originals. Being gas fired, all the aesthetic advantages of a freestanding stove can be enjoyed without the effort of starting and maintaining a fire or having wood and ash to deal with. Conventional flue models can be fitted into Class 1, Class 2 and Pre-cast flues and come complete with an innovative closure plate system for existing 16” fireplace openings. BF models have a rear mounted “through the wall” flue system supplied with the unit. Additional extension pipes are available to cope with exterior wall applications up to a useful 970mm thickness. Both the CF and BF models are available in either natural or LPG gas. The stoves feature highly realistic log fuel bed, large panoramic window and adjustable feet for uneven rustic hearths. The conventional flue stoves are manual control using the single knob at the front for easy control including piezo ignition. Net thermal efficiencies of up to 78% provides excellent economy in operation. The balanced flue stoves are full sequence infra-red remote controlled and offer net thermal efficiencies of up to 88% at the press of a button. The RRP of the conventional stoves is £1,072 Inc. VAT and the balanced flue stoves are £1,499 inc. VAT.